In anticipation of his upcoming keynote conference presentation, Buy or Wait? 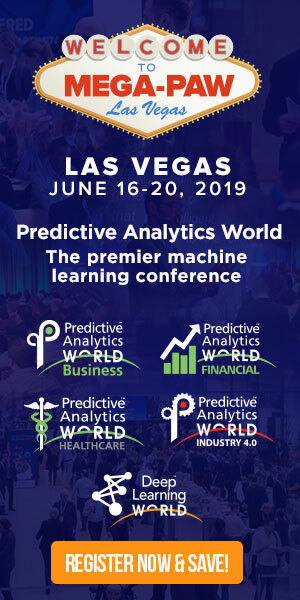 How the Bunny Predicts When to Buy Your Plane Ticket, at Predictive Analytics World San Francisco, April 3-7, 2016, we asked Dr. Patrick Surry, Chief Data Scientist at Hopper, a few questions about his work in predictive analytics. A: At Hopper we predict how airfares are likely to move so that we can advise consumers whether they should buy now or wait for a better price. A: Our goal at Hopper is to help consumers save money on flights with data-driven advice about when to fly and buy, and even where to go. Airfare predictions are a core part of our value proposition: On average the “buy or watch” advice in our app saves consumers 10% over the first price they see for a trip. A: In extensive back-testing across tens of thousands of trips, we’ve shown that 95% of the time our “buy or wait” recommendations will either save the consumer money or do no worse than the first price they saw, saving 10% on average. A: We’ve been surprised at how much airfare fluctuates. Although on average airfare rises as departure approaches, watching continuously is very effective at capturing lower prices. More than half the time we’re watching a trip, we’ll see a price that’s 5-10% lower than our initial price within just 24 hours. A: Airfare trends are surprisingly predictable, enabling consumers to save up to 40% on their flights using the Hopper app, while avoiding the frustration of manual comparison shopping. Top tips for saving: Start watching prices early, be flexible with dates and destinations if possible, and do your homework for the route(s) you’re interested in so you know what prices other people are paying. One example: Fares rise higher for routes with lots of business travelers, so you won’t find a last minute deal from New York to San Francisco, but you might find one from New York to Hawaii. Don’t miss Patrick Surry’s keynote conference presentation, Buy or Wait? How the Bunny Predicts When to Buy Your Plane Ticket on Monday, April 4, 2016 from 1:30 to 2:15 pm, and Patrick’s conference presentation, Applying Next Generation Uplift Modeling to Optimize Customer Retention Programs, on Monday, April 4, 2016 from 11:20 am to 12:05 pm at Predictive Analytics World San Francisco. Click here to register to attend. USE CODE PATIMES16 for 15% off current prices (excludes workshops).